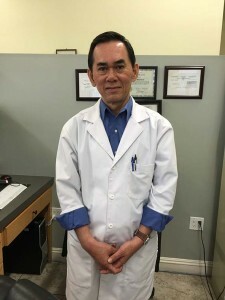 Home › Doctor › Tien Bao, D.C.
Dr. Tien Bao, D.C. is a chiropractor that specializes in spinal musculature disorders. He was expertly trained at Southern California University of Health & Sciences to diagnose and treat the many musculature injuries. ​Chiropractic treatment is designed to restore normal alignment and thus minimize pain and suffering. Gentile manipulative therapy or “Adjustment” is often effective in rapidly returning the injured person to a productive status. Dr. Bao will provide guidance with advice designed to reduce work-related injuries, proper lifting procedures and therapeutic stretching exercises.